Warm and dry weather has harvest well ahead of the five year average according to Saskatchewan Agriculture’s Weekly Crop Report. In southeast Saskatchewan, producers now have 60 per cent of the crop in the bin, up from 37 per cent last week. This is well above the five-year (2012-2016) average of 39 per cent for this time of year for this region. An additional 20 per cent is swathed or ready to straight-cut. Many areas reported no to very small amounts of rain last week. The Tantallon area, which received the most, only got three mm. Alida remains the area with the most precipitation (199 mm) in the region since April 1. Topsoil moisture conditions remain low. Topsoil moisture on cropland is rated as 13 per cent adequate, 53 per cent short and 34 per cent very short. Hay land and pasture topsoil moisture is rated as six per cent adequate, 41 per cent short and 53 per cent very short. Crop District 3ASE is still reporting that 100 per cent of cropland, hay land and pasture remain short to very short topsoil moisture at this time. As well, in Crop District 2A, 100 per cent of hay land and pasture is short to very short topsoil moisture conditions. The majority of crop damage this past week is due to lack of moisture and strong winds, which are causing canola swaths to roll around. With the prevailing dry conditions, producers are worried about stubble fires, which have been reported in some areas. Across the province, 45 per cent of the crop is now in the bin, compared to the five year (2012-2016) average for this time of year of 28 per cent combined. Twenty-eight per cent of the crop is swathed or ready to straight cut. Harvest progress is most advanced in the southwest region where 70 per cent of the crop is now combined. The southeast region has 60 per cent combined, the west-central region 44 per cent and the east-central region 36 per cent. The northeast region has 12 per cent combined while northwest region has 18 per cent combined. Ninety-nine per cent of fall rye and winter wheat, 91 per cent of lentils, 90 per cent of field peas, 58 per cent of mustard, 62 per cent of durum, 51 per cent of barley, 27 per cent of triticale, 38 per cent of spring wheat and 26 per cent of canola have now been combined. Twenty-four per cent of oats, 31 per cent of chickpeas, 16 per cent of canary seed and nine per cent of flax have been combined. 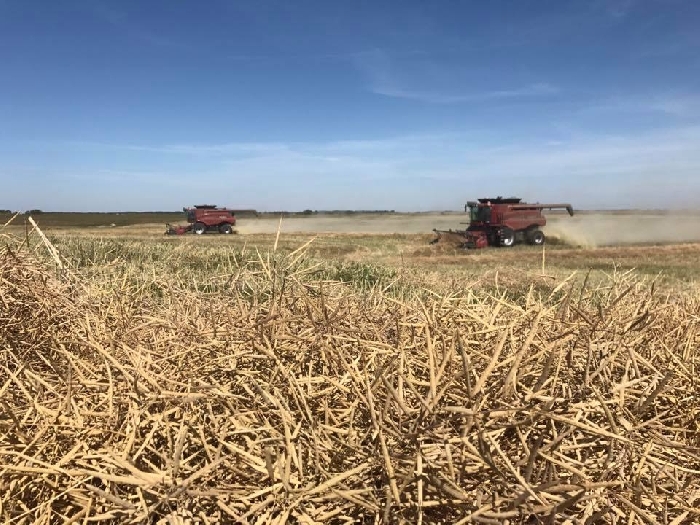 Forty-nine per cent of canola and 29 per cent of spring wheat and mustard have been swathed or ready to straight cut. Not much progress has been made on soybean as harvest progress for this crop remains at 18 per cent combined, similar to the previous week. The majority of the province received little to no rainfall this past week, with the highest rainfall for the week (56 mm) reported in the Langenburg area. No other area received a similar amount of rainfall, as the next highest amount reported was six mm in the Nipawin area. The Pierceland area still holds the highest amount of rainfall received in the province since April 1 at 543 mm. Topsoil moisture conditions remain low. Across the province, topsoil moisture on cropland is rated as 24 per cent adequate, 42 per cent short and 34 per cent very short. Hay land and pasture topsoil moisture is rated as 19 per cent adequate, 38 per cent short and 43 per cent very short. The majority of crop damage this past week is attributed to lack of moisture and strong winds.